Growing Radishes in Containers and Pots is easy and quick, and you can enjoy best-tasting crispy homegrown radishes without having a garden. Radishes belong to the Brassicaceae family just like cauliflower, broccoli, mustard, cabbage, and turnip. Because it is easy to grow and harvest them quickly, they are a popular cool weather crop among gardeners. 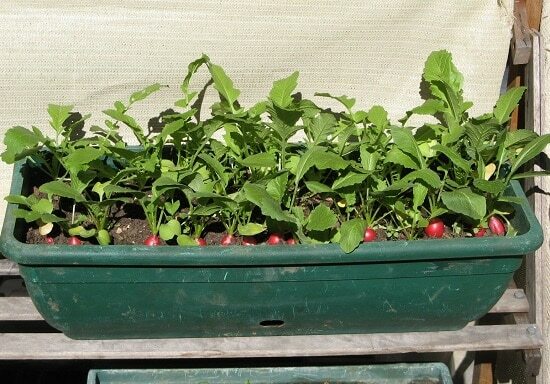 Growing radishes in containers is not difficult as well in a limited space. You can enjoy fresh and crispy radishes and tasty green tops right in your apartment balcony, patio, porch, rooftop or even indoors on your window sill. If you’ve grown other root vegetables previously, this is not much different. 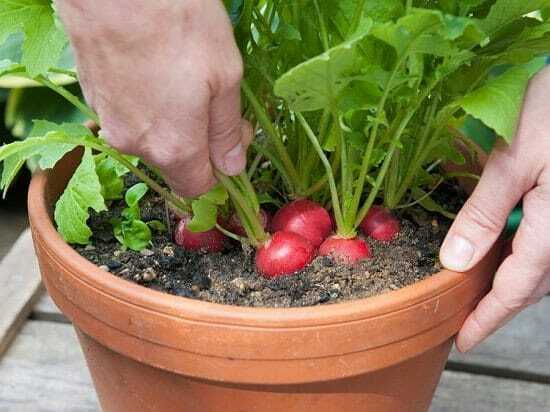 After reading this post, you’ll learn how to grow radishes in pots easily! USDA Zones: All, Planting time may differ. The most common way of propagating radishes is from seeds. As they are quite common, you’ll be able to get seeds of all the radish varieties in a garden shop or online. Instead of sowing radish seeds in seed trays, plant them directly in the desired pots. Sow the seeds 1/4 or 1/2 inch deep and 1 inch apart into the potting medium and gently cover them back with the mix. Between 3 to 10 days, the seeds will germinate, and tiny plants will emerge. Thin out the seedlings, so they are only two inches apart. No need to throw away the thinned greens, they make a delicious and nutritious addition to salads and other microgreens. If you’re growing large radish varieties like daikon, space the seedlings 3-4 inches apart. NOTE: For the harvest to last longer, do succession planting and resow the seeds in every 2 weeks, if you’ve space available. 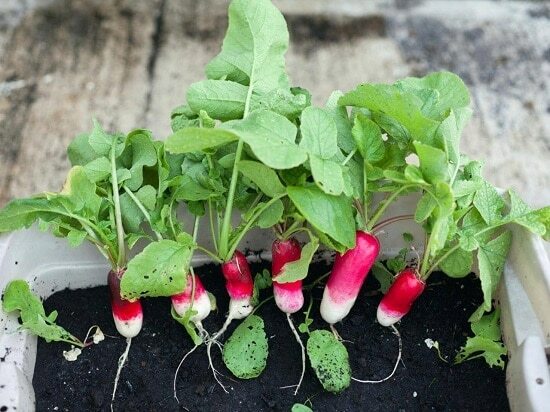 Start your radish seeds in spring as soon as the soil temperature is above 40 F (5 C) and the weather starts to warm up. Even if the weather is not favorable, you can easily plant the radish seeds indoors in early spring and continue to do so every other week for regular harvest. 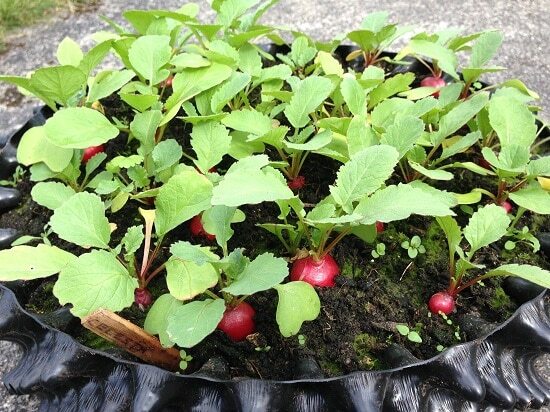 Keep growing radishes till early summer and stop. Then, again, begin planting from late summer or early fall (autumn) till early winter. If you’re not living in hot subtropical and tropical climate, growing radishes in pots in summers is also possible. Sow seeds of summer varieties and take advantage of the microclimate you can create by container gardening. Water summer radishes more often and change location to save them from the intense afternoon sunlight. In hot, frost-free climates, begin planting radishes in containers from late fall or early winter and continue planting successively throughout the winter. Note: Radishes grown in high temperatures are usually spicier. Radishes come in many shapes, sizes, and color. There are round radishes like pink beauty, cherry belle (the most common one), cherriette, Easter egg, early scarlet globe–Some of the popular varieties that mature within 3-5 weeks. Then, there are elongated ones like French breakfast that taste so crispy and juicy, perfect for munching. 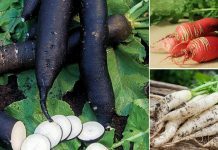 If you crave for unique looking radishes, grow the watermelon radish or select a black radish variety, black radishes have strong flavor than other types of radishes. Icicle radishes come in a cylindrical shape, more like carrots but white in color and 5-6 inches long, they must not be confused with daikons. Daikons are large sized white colored radishes, sweet and crispy with a hint of mild peppery flavor like mustard. If picked late, the peppery flavor becomes intense and spicy, and daikons become woody, same is the case with all the radish types. Tip: Learn about more radish varieties in this article. 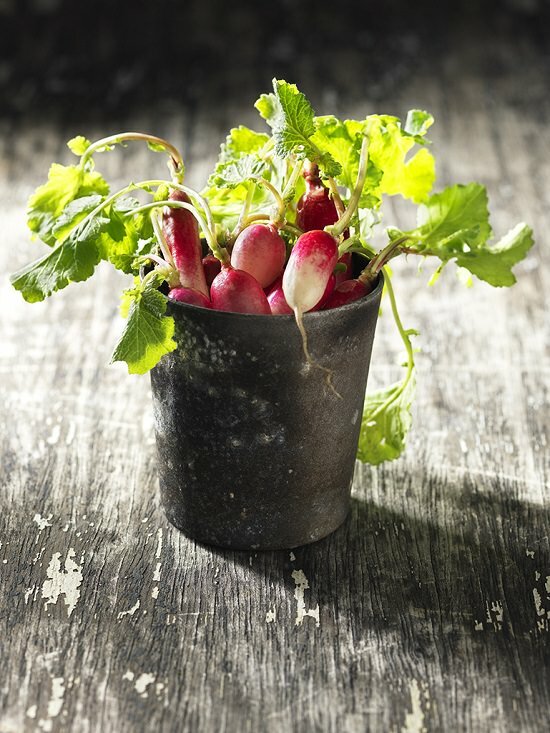 Choosing a pot for growing radish depends upon the radish variety you’re growing. Wide and shallow windowboxes and troughs are most suitable for this purpose. Select a pot that is at least 6 inches deep for most regular radish varieties like Cherry Belle, Purple Plum, and Easter Egg. These radish varieties take 3-5 weeks to reach the harvesting period after planting. Most radishes don’t require more than two inches of spacing. However, some large varieties, such as white radishes “Daikon” are long and require a deep 12-14 inches pot and 3 to 4 inches of spacing. The diameter of the pot for both small and large varieties depends on the number of radishes you are planning to have. If your pot is 12 inches wide, you can grow 6-7 plants of usual radish varieties in it. In a similar pot, you can grow 4 radish plants of large varieties. Grow radishes in a sunny location, 6-8 hours of direct sunlight is essential for optimum growth. It can also grow in part sun (around 4-5 hours), but lack of sunlight results in slow growth. Although, if you’re growing radish in a hot climate or summers, you can easily grow this root vegetable in part sun. 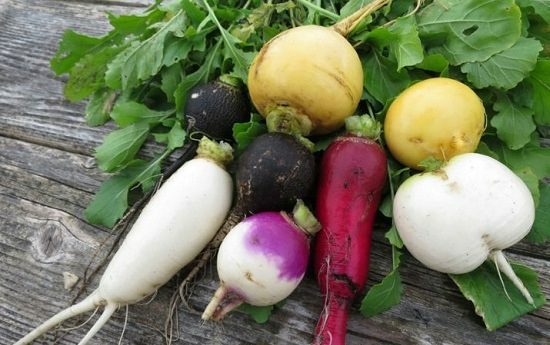 Radishes prefer rich, well-drained and permeable soil that doesn’t obstruct the root growth. For that, buy a quality potting mix or make your own. The one you make should be loamy than clayey and have no stones. Additionally, you can add a handful or two of compost or well-rotted manure in your potting mix at the time of planting container radishes. 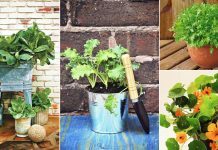 If your balcony, patio, or rooftop is windy or you’re growing radishes in railing planters, it’s better to improve the moisture-retaining capacity of the potting soil. You can add any of these organic materials like peat moss, compost, aged manure, or coconut coir. Using perlite or vermiculite is also an option. Keep your soil evenly moist for a quality crop. Make sure you water deeply and never allow the pots to dry out completely, especially in the first few weeks. Keep in mind that having moist soil doesn’t mean to overwater. Soggy soil and overly wet conditions are as avoidable as drought. Water your radish plants regularly. Irregular and infrequent watering technique like keeping the plants dry for some time and then pouring water to create really moist condition can lead to cracking of the roots. Radish is a cool-season crop that grows best in short days. The minimum seed germination temperature is 40 F (5 C), and the maximum is 95 F (35 C). The optimum seed germination temperature falls in the range of 55-85 F (13-30 C). Below or above this, seeds germinate slowly. Most flavorful and crispiest radishes grow in moderately cool temperatures, which is 50-70 F (10-21 C). You can grow radish in the temperature range of 40 F (5 C) to 90 F (32 C) without much difficulty. At the time of planting, mix slow-release fertilizer in the potting soil. If you’re an organic gardener, add one third part compost or aged manure in the soil, instead of the granular fertilizer. As too much nitrogen can cause foliage growth and lush radish tops, it’s better to feed radishes with low nitrogen formula like 5-10-10. You can also feed with general purpose fertilizer like 20-20-20–if the above or similar NPK ratio is not available. Once your radishes are two weeks old and not performing well, you can fertilize again with a weak dose of water-soluble fertilizer. Also, if you missed adding anything at planting time, fertilize your radishes regularly in every 10-14 days with a 5-10-10 or 5-10-5 water-soluble fertilizer. Container grown radishes have no major pests or diseases problem. But aphids and flea beetles might irk you. Wash aphids with a blast of water or use insecticidal soap. In diseases, downy mildew can affect your plants. To avoid, provide proper air circulation and don’t keep the foliage wet. Early maturing radish cultivars can be harvested within 20-40 days after planting. Some varieties such as Cherry Belle and French Breakfast are ready for harvest in 23-30 days. Asian radish varieties like daikons take 60-70 days to reach maturity. Be vigilant when it comes to harvesting radishes. Waiting too long can turn radishes woody, cracked, and peppery. Not just the radish roots, you can also harvest radish tops. 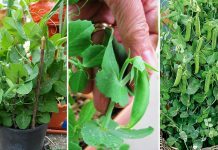 Harvest the young and green leaves to use in salads and soups or prepare exotic recipes. How Many Radishes to Plant for Sufficient Yield? Depends on how much you consume and how many members are there in your family. On average, grow 12-15 radishes per person every month. You’ll need a single 24 inches wide windowbox for that. Can You Grow Radish Indoors? Yes, growing radish indoors is fairly easy and this way you can savor year-round homegrown radishes. Get a couple of long rectangular pots and sow the seeds directly and wait for seedlings to emerge. If one of your windows receive 5-6 hours of direct sunlight, you’re all set. All the growing requirements are similar, but you’ll need to be careful about watering.